What does the word “study” mean to you? Have you ever told your students to study for a test? Have you ever actually taught them how to study? It turns out studying can be taught. 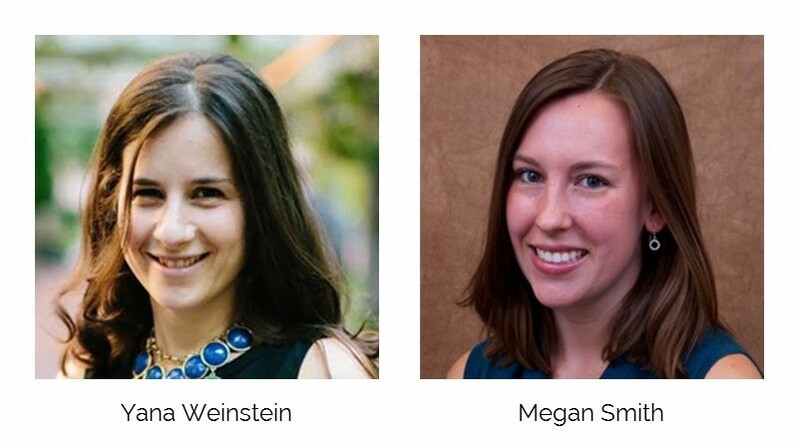 And two cognitive psychological scientists, Yana Weinstein and Megan Smith (whose name has changed since this post to Sumeracki), have made it their mission to teach people how to study better. On their new website, The Learning Scientists, they use infographics and videos to share strategies and other insights about how we learn. Here we will explore six research-based learning strategies that Weinstein and Smith teach on their site. If we can work these methods into our instruction, and teach students how to use them on their own, our students stand a much better chance of actually remembering our material. One final note before we dig in: Although performance assessments and project-based learning allow students to show what they know with more depth and authenticity, most content areas still need to measure some learning with tests. When you are teaching that kind of content, these six strategies will help your students perform better on the test AND retain that information long after the test is over. Space out your studying over time. Far too many students wait until the night before a test to study for it. Similarly, teachers often wait until the day before a test to review. When enough students score well on the test, it appears they have learned the material. But a few weeks later, most of that information has vanished from students’ minds. For more durable learning, the studying has to take place in smaller chunks over time. Practice bringing information to mind without the help of materials. Many people think of “studying” as simply re-reading notes, textbooks, or other materials. But having the information right in front of us doesn’t force us to retrieve it from memory; instead, it allows us to trick ourselves into thinking we know something. Recalling information without supporting materials helps us learn it much more effectively. Teach students how to do retrieval practice in class: Have them turn off their devices, put all their notes and books away, then ask them to write everything they know about a particular term or topic, or share their thoughts in a think-pair-share. When the practice is done, have students check their understanding by revisiting their materials and discussing misconceptions as a class. Once they learn how to do this in school, they can then apply it at home. Explain and describe ideas with many details. This method asks students to go beyond simple recall of information and start making connections within the content. Students should ask themselves open-ended questions about the material, answer in as much detail as possible, then check the materials to make sure their understanding is correct. Teachers can apply this strategy by having brief class discussions where these kinds of questions are explored and asking students to work elaboration into their own study plans. Switch between ideas while you study. Common knowledge tells us that to learn a skill, we should practice it over and over again. While repetition is vital, research says we will actually learn that skill more effectively if we mix our practice of it with other skills. This is known as interleaving. “Let’s say you’re doing a bunch of math problems,” Weinstein says. “What’s fairly typical is … five of the same problem, or 10 of the same problem. Instead of doing that, try different problems in different orders.” So if students are learning to calculate the area of a triangle, instead of having them do 20 problems with triangles, have them do one of a triangle, then one of a circle, then a triangle, then a square. When planning exercises for students, resist the temptation to have them repeat the exact same process multiple times in a row. Instead, have them do a few of the new process, then weave in other skills, so that the repetitive behavior is interrupted and students are forced to think more critically. Explain this strategy to students so they can apply interleaving to their own studying. Use specific examples to understand abstract ideas. Teachers can apply this strategy by using concrete examples when teaching abstract concepts, then asking students to come up with their own, correcting any examples (or parts of examples) that aren’t quite right, and looking for more. Encourage students to continue this practice when they study. When information is presented to us, it is often accompanied by some kind of visual: An image, a chart or graph, or a graphic organizer. When students are studying, they should make it a habit to pay attention to those visuals and link them to the text by explaining what they mean in their own words. Then, students can create their own visuals of the concepts they are learning. This process reinforces the concepts in the brain through two different paths, making it easier to retrieve later. In class, regularly turn students’ attention to the visuals used in textbooks, on websites, and even in your own slideshow presentations. Have students describe the visuals to each other and make connections with what you’re learning. Then have students create their own visuals of the content to further reinforce it. Remind students to include diagramming, sketching, and creating graphic organizers when they study at home. Combine them. These strategies don’t necessarily work in isolation. You can space out your retrieval practice, and when doing retrieval practice, try to recall concrete examples, elaborate, or sketch out a concept. When doing retrieval practice, you can interleave between different concepts. Make them part of your class vocabulary. If you just use these strategies in your teaching, you’ll see improvement. But if you actually explain the research to students, teach them the terminology, and use that terminology when teaching—”Okay, we’re going to spend a few minutes on retrieval practice”—students will not only have a clearer understanding of why you’re doing what you do, but they may be more likely to carry those skills with them into future classes. The Learning Scientists site is full of useful information about how people learn, and more is being added every week. 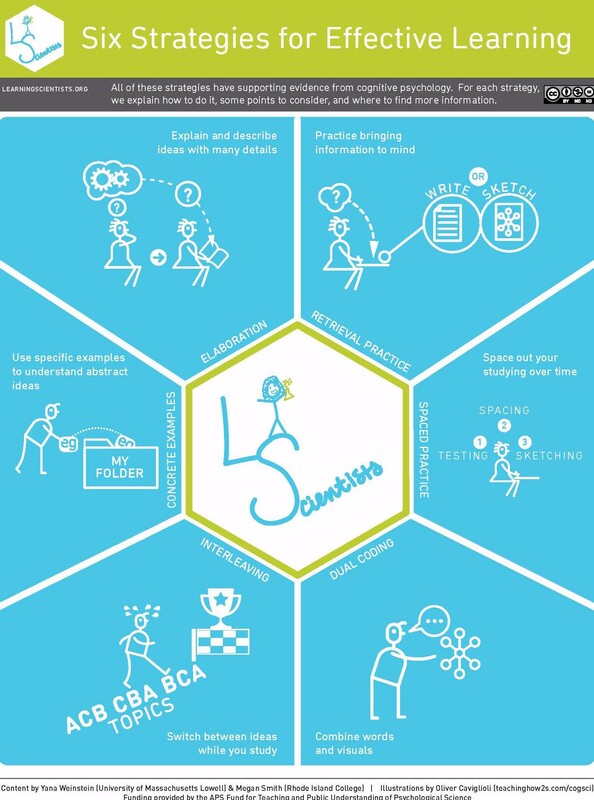 To learn more, visit learningscientists.org, and to download this free chart and other materials about the strategies, click the image below.